The Perth branch of Accuweigh recently installed tank scales for Optima Agriculture’s plant in Osborne Park WA, for high accuracy weighing of liquid ingredients used in the manufacture of their fertilizers. To prevent any excessive tank movements due to external forces like wind, bumping by fork lift, etc. the tank scales are mounted on 4 x Flintec RC3 industrial load cells fitted with restraining mechanisms. An Accuweigh X320 hazardous area indicator with IP69K rating was fitted due to the external mounting position of the tank scales. 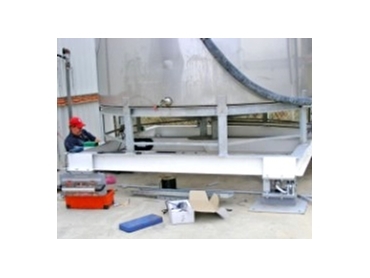 The existing thin wall stainless steel tank required a support structure to be fitted underneath the tank to provide a sturdy fixing point for the tank scales load cells. To ensure the accuracy of the tank scales wasn’t compromised by the pump operation the pump used for filling and emptying the liquids was also fitted to the support structure. Optima Agriculture is a 100% W.A. owned and run company that manufactures a selected range of calcium based soil and plant improvement products and places a strong emphasis on providing a quality range of products that deliver great results year after year.